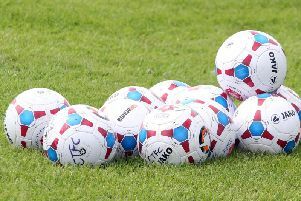 Kings Langley are now holding the fifth and final playoff spot with a six-point advantage and just five games to go after they defeated Tiverton Town 2-1 on the road on Saturday. It’s an amazing turnaround for the Kings outfit as back in early November they were battling against the drop in the Southern League Premier South. A man of the match display by Rene Howe inspired Kings to a first-ever victory at Tiverton’s picturesque Ladysmead ground at the weekend as Kings continued their quest for the playoffs. It backed-up their crucial 2-1 home win over Hartley Wintney on Tuesday night. Kings opened as brightly as the beaming sun on Saturday, only astute attention by the home defence prevented Andronicus Georgiou, playing in an advanced forward position, from making an impact. The hosts, however, are a force on their own pitch as recent victories against high-flyers Met Police and Salisbury will attest. 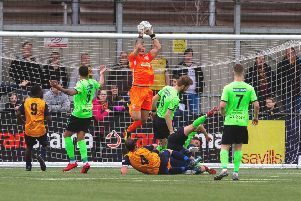 They were soon displaying their own attacking intent and an incisive run by Josh Key ended with a searching cross to the head of Stuart Yetton only for Kings’ keeper Alex Tocarczyk to thwart the striker with a stunning save. A series of dead-ball situations saw Tiverton come close to breaking the deadlock but Kings’ resilience paid off on 18 minutes when a brilliant solo effort by Howe gave Kings a 1-0 lead. The bustling striker collected the ball on the edge of the box and steered a low shot around his marker and the keeper Liam Armstong’s dive. Kings joy was short-lived when three minutes’ later Tiverton’s prolific forward Levi Landricombe scythed a free-kick through a forest of legs to restore parity. The visitors responded well and a fine run by Georgiou brought a flying save from Armstrong as honours ended even at half-time. The second period opened with both teams battling to gain the initiative. Only prompt intervention by Kings centre back Jorell Johnson prevented Steve Colwell scoring and then a mazy run by Kings’ Lewis Putnam set up Howe, but he opted to cross rather than shoot and the chance was lost. Putnam later combining well with Connor Smith and Georgiou but again a good opportunity went begging. The hosts had chances of their own, Key setting up Landricombe only for a timely intervention by Callum Adebiyi to deny Town’s top scorer. With the game heading for a stalemate, Kings’ boss Steve Conroy introduced Royston loanee Rohdell Gordon and the speedy winger made an immediate impact by setting up Georgiou but the shot was well-saved by Armstrong. However, the debutant was not to be denied. In the 79th minute he combined with Howe to cross low for Stevie Ward, and for the second game running the forward was on hand to volley home what proved to be the winning goal. Kings held on for a vital win that saw them take a big step closer to securing a dream playoff place. The visitors took the lead on 35 minutes through a Michael Campbell header and held that edge to half-time. But Georgiou levelled on 50 minutes with a swerving shot into the far corner of the net, before Ward volleyed a powerhouse winner five minutes from time. It was a fitting end to what was probably the best game of football seen at the Sadiku Stadium this season and commiserations must go to the visitors that their superb contribution to the spectacle was to see them go home empty handed. Kings continue their bid to fend off the chasing playoff pack this Saturday when they host ninth-ranked Swindon Supermarine. The reverse fixture in late September resulted in an exciting 4-3 win for Kings. A victory will be key as the following weekend sees Kings travel to second-placed Taunton Town.